CE Credits: 8 - Meets requirements for Washington State Law. 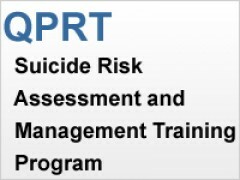 The QPRT Suicide Risk Assessment and Management Training Program is an 8-10 hour course (depending on practice sessions competed) for health professionals that is designed to reduce mental health consumer morbidity and mortality by standardizing the detection, assessment, and management of patients at elevated risk for self-directed violence in all settings and across the age span. Training is conducted online or face-to-face by a qualified QPRT instructor. "The QPRT Suicide Risk Assessment and Management Training Program was developed by a multidisciplinary team of psychiatrists, psychologists, nurses, and mental health therapists at Spokane Mental Health, Spokane, Washington, in response to fatality review reports indicating that a lack of standardized suicide risk assessment may have contributed to preventable patient deaths. Beta testing of expert opinion protocol questions were solicited from members of the American Association of Suicidology and vetted by external records review. This course includes 1 hour of content focused on preventing veteran suicide. National surveys have found that very few practicing clinicians use formal suicide-specific assessment methods or psychological tests to assess suicide risk, but do rely on the clinical interview. The QPRT model was developed by clinicians for clinicians to fill this need for a brief, structured risk assessment clinical interview. QPRT has been successfully employed with more than 400,000 patients of all ages in all settings over the past ten years. Competencies taught in QPR Institute courses are based upon recommendations from the US Department of Education, National Center for Education Statistics and follow recommendations found in "Defining and Assessing Learning: Exploring Competency-Based Initiatives," NCES 2002-159R, prepared by Elizabeth A. Jones and Richard A. Voorhees, with Karen Paulson, for the Council of the National Postsecondary Education Cooperative Working Group on Competency-Based Initiatives. Washington, DC: 2002. Competency Movement: Rodolfa, E., Bent, R., Eisman, E., Nelson, P., Rehm, L. Ritchie, P.(2005). A cube model for competency development: Implications for psychology educators and regulators. Professional Psychology: Research and Practice, 36, 347‐354. "This Registered Best Practice training program teaches the core competencies required of professionals responsible for the care and safety of consumers detected to be at elevated risk for suicidal self-directed violence. Following foundational lectures on epidemiology, clinical risk patterns, and the current status of suicide risk assessment, clinicians learn how to conduct a standardized, evidence-based, seven-step interview designed to elicit perceived burdensomeness, suicidal desire, intent, capability and buffers against suicide. .
Data collected is then contextualized within the consumer’s current personal crisis to better understand, anticipate, and implement risk mitigation strategies, including evidence-based treatments. Based on the quality of the relationship, the difficulty of the interview, and the reliability of the data collected, participants learn to make informed risk stratification decisions to determine level of care recommended or required. Training includes modules on means restriction counseling, collaborative crisis safety planning, managing/monitoring risk over time, documentation, and a skills practice session." "Can do it in spare time, in modules to take your time." "The overall assessment plan and the strong rationale behind it. I particularly liked the short mini lectures." "I finally learned an evidenced-based suicide risk assessment and how to conduct a safety plan! Amazing... it has only taken 18 years of education to find it." "I liked that things were reinforced multiple times, that practical assessment and intervention techniques were provided that were backed up by statistics in the foundation segment." "This training has been extremely helpful. I only wish I could have received the training sooner! I've already recommended it to others!" "Its usefulness, research grounded, reality focus and examples, and it was relevant to my position. The use of real cases examples throughout as well as the video presentation intermittently added much value. Also the videos broke up the required reading." "The risk factors section and the 7 questions." "The step-by-step process is easy to remember and follow." "Practical tools such as specific questions and forms to use in clinical practice." "General info (stats), the QPRT assessment and the examples of probing, the statistic regarding LGBT youth, self-reflection components." "Info I can use in my job." "The sample scripts and the practice activities." "The QPRT format itself is unique. Providing a more structured guide to interviewing is extremely beneficial." "Having more background into the kinds of people who consider suicide and the best way in which to interact with them to be successful in stopping them from completing a suicidal act." "Have a set approach that is standardized and used by many clinicians when working with suicidal patients." "Sample interview and safety plan ideas." "Videos, exercises, & sample materials. Not just listing risk and protective factors, but explaining in more detail, why these are risk factors (e.g., being gay, per se, isn't a risk factor but this population experiences more events that put them at risk)." "A comprehensive and useful presentation." The final exam is a national 25-item test validated on thousands of licensed mental health professionals. There are 36 items in the exam, with items rotated at random intervals to produce the 25 on which you will be tested. After taking this course, and if you are interested, the QPR Institute trains and licenses qualified instructors to teach this course in a classroom setting. Time required is roughly 40 hours of advanced self-directed training. Licensed trainers may issue certificates to those they train, earn fees, and may be invited to join our training faculty. Large employers may be interested in our Suicide Risk Reduction Program institutional unlimited use package pricing. Please inquire or see our we pages.